Another weekend coming up and another edition of Ready For The Weekend. Let's not hang about, let's dive into the Aladdin's cave of British Wrestling and take a look at a few of the gems on offer. Friday night kicks off the wrestling weekend with Fight Club: PRO at The Planet Nightclub in Wolverhampton. The first match announced by Fight Club: PRO was one that had any fan of tag team wrestling visibly frothing at the mouth to see as The Hunter Brothers, arguably one of the best tag teams in Europe right now face the reunited duo of Eddie Dennis & Mark Andrews, collectively known as F.S.U. All four of these men have been tearing up FC:P for a number of years but when they are in tag team action, they take it to another level. This looks to be another memorable match for the history books of Fight Club: PRO. Speaking of history, two individuals who have a lot of history between them is Chris Brookes & Nixon Newell. Former tag team partners turned bitter enemies after Brookes turned his back on Nixon only to attack her on numerous occasions. Nixon has not backed down from Chris Brookes, getting her own back on her former partner at previous shows. Their issues need to be settled and on October 23rd they look to end it once and for all. The main event scheduled for 'Project Mayhem IV' will literally be a war of chaos. An 8-man war between MK McKinnan, Jimmy Havoc, Pete Dunne & Damian Dunne of K.Y.S. and Dave Mastiff, Clint Margera and Moustache Mountain's Tyler Bate & Trent Seven. Each team hates the other and everyone is out to prove a point to the other. The Planet has seen a number of battle over the years but this may be the biggest ever and forget the ring, the city of Wolverhampton may not be ready for the violence coming it's way this Friday night. 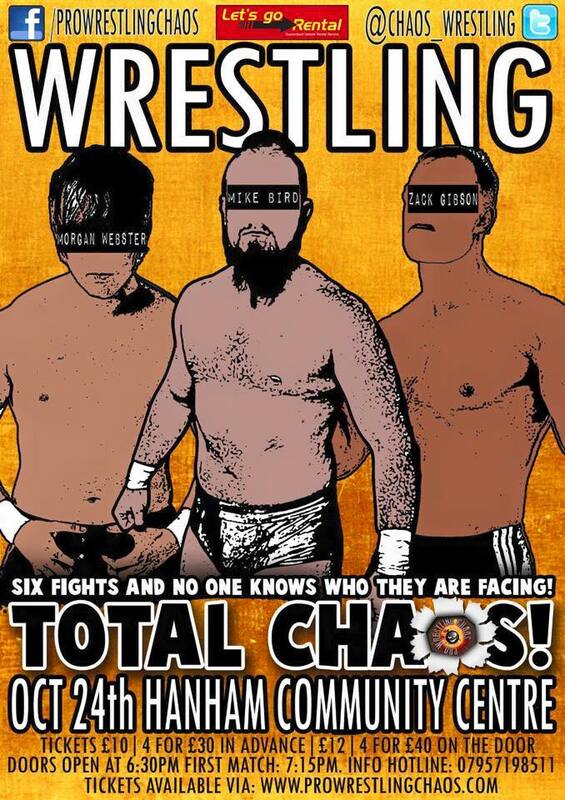 Moving on to Saturday night and Pro Wrestling Chaos will be at the Hanham Community Centre in Bristol with 'Total Chaos'. Unlike other shows that PWC have hosted in the past, this event has no matches for it at all. Now while this may seem strange, the whole premise of this event is that nobody will know who they are facing on the night. All we know is who will be there. We would normally talk about certain matches scheduled to take place but as we don't know what they'll be, we'll discuss a few of the men who will be in action. 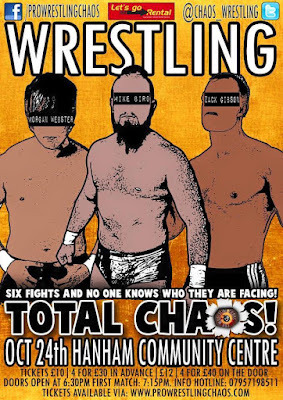 The first man who was announced for 'Total Chaos' was the reigning King Of Chaos Champion, Mike Bird. The champion has more knowledge of the night than others as he does know that he will be defending his championship in a match but he has no idea who his opponent will be or even how many there will be. He may have only just won the championship for a second time but he could have a reign that lasts less than one show if the draw doesn't fall in his favour. Another man confirmed for October 24 is the former Doomsday Killer, Gideon. After his return at 'The King Is Dead, Long Live The King', he has fire in him that few have seen from him. He will hope that he faces someone from the Doomsday Killers so help anyone else who happens to stand opposite him on Saturday. October 24th will also throw in even more unknowns when Chuck Cyrus & Pastor William Eaver both make their debut in Pro Wrestling Chaos. Both men will look to make a statement on their first night but against who, nobody knows. championship match. Sunday night will also see the Kamikaze Pro Fighting Females Division in action as Toni Storm, Nixon Newell & Shanna compete in a triple threat match. Nixon & Shanna faced each other on Kamikaze Pro's last show with Shanna narrowly picking up the win. Now it's time to up the ante and the number with the inclusion of the very talented Toni Storm. While Shanna may have won last time, there is no indication to say that history will repeat itself as anyone of these women have the skills and talent to take the win in Stechford.